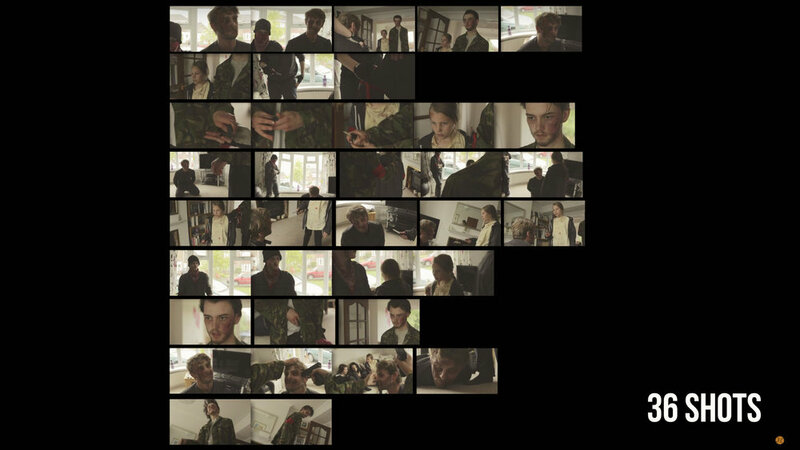 So you’ve got a script in your hand, a camera on standby, and a bunch of actors at the ready. But before you start shooting, you need to figure out where everyone is going to be throughout the scene. Today we’re going to talk about blocking. Where are the actors in the scene? Do they move? Where do they move? How does the camera show this? Is it static? Is it panning or tracking? Blocking is the process of working out the all of this out. 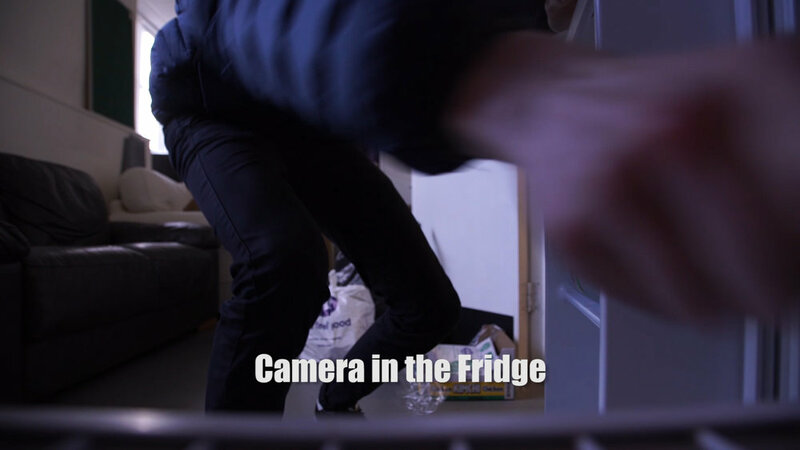 It’s like dance choreography, but instead of dancers performing dance moves on musical beats, you have the actors and the camera performing actions on script beats. We usually start by choosing marks for the actors. These are static positions where the actors will stand during moments in the scene. You can cue an actor to then travel from one mark to another mark creating a movement in the scene. One quick note: People rarely stay completely static. So if you want a simple way to help achieve a more cinematic look, or the film look, get your actors on their feet and moving around during the scene. And if they are stood still or sitting, have them move in another way, such as eating, putting on makeup, or drinking a cup of tea. Once you are happy with how the actors are moving in the scene you can bring in the camera. We start off by plonking the camera in front of an actor’s mark and framing it up. If they are positioned here for the majority of the scene, this is a good starting point for coverage. Then think about how to cover the movement in the scene. You want the audience to know where everyone and everything is to each other in the scene, so make sure to cover their movement so the audience can understand the geography of the room. Cutting back to a wide shot is arguably the easiest method to achieve it. Once you have this all thought out, you can make adjustments to the blocking of the actors and the camera to help: light the scene better, cover the room easier, and reduce or increase movement. All of your choices will determine how the film feels. The movement of the actors, their body language, where they are standing or sitting, the lighting at each of their marks; this is all up to you to decide, and each decision will be necessary to convey the story you want to tell. We used blocking to give the audience information about the character, in replace of dialogue. For example, in our latest film Backstage The Medium slowly walks over to the stall to convey reluctancy in his character. He doesn’t really want to help The Flyswatter. Jenny the Stage Manager storms into the room to convey she is in a state of power. She even blocks the way out with her arm to further identify that “Hey, I’m the boss. You’ll leave when I let you leave”. You can also use blocking to make adjustments and tailor the set to make it more dynamic. We had the problem of where to place The Medium’s mirror on set. We needed it positioned in front of him in order to achieve the first shot in one take, but it was too tall on the counter when The Medium gives The Flyswatter a lecture at the end of the scene. So we made the change to have The Medium pack it away, completely solving the problem AND giving The Medium an activity to perform while The Flyswatter rambles on in the toilet cubicle. It might not be a fancy light, or a super expensive camera, but something like well thought out blocking can create dynamic, realistic, and a cinematic image, getting you one step closer to achieving the film look. 🚀 http://bit.ly/synergy-pack - Get professional assets for your video from RocketStock.com. Their "Synergy" video pack is perfect for video editors and animators looking for versatile elements for any type of project. 🎵 http://bit.ly/pb-funkyblues - Click here to download this episode's track. Check out Premiumbeat.com to discover a huge range of exclusive royalty free music! A way you can work faster on set is by being organised and knowing what you need to shoot before day 1 of principle photography. So what is the process of turning the pages of your script into a production plan? 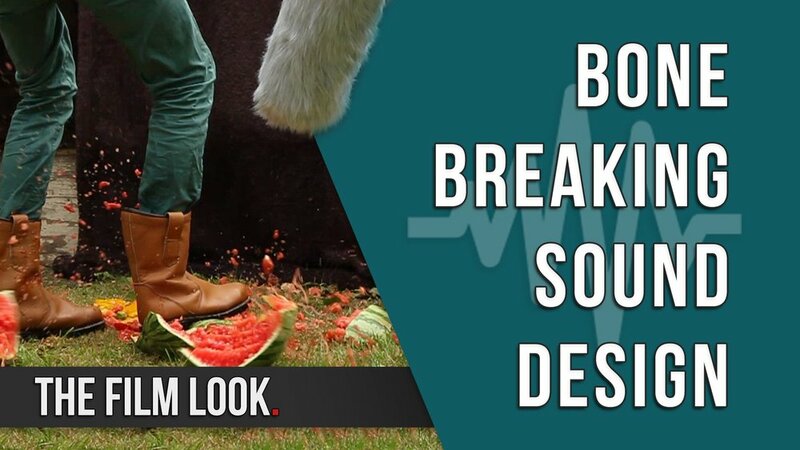 In a previous episode we spoke about the process of breaking down your script and extracting all of the different props, costumes, locations, cast, and any other things you need in order to make your film. The process of working out which shots you need is very similar, but instead of extracting this information you need to add it. This is the script for our short film Backstage and once it was complete we went through the script and started to note down some of the shots we thought we needed. A wide shot then a close up here, over the shoulder shot here. You can start to create a shot list, for now pen and paper will work, or even Word, but if you have access to something like shot lister, it’ll keep you more organised. Now you have a brief list of what you need, test shoot these shots. If you can go to the location you will be shooting in, this will help you work out if you the shots you have written down will give you enough coverage, and if you need to add some extra shots. For the storyboard Richard stood in place where The Medium would be, looked in the correct direction, and since we did not take a tripod I put my hand in front of the camera to create the Over the shoulder shot. If you can not use the location before you shoot, the next best thing is to test out your shots in your living room or bedroom. We also did this for the last scene in our short film, as the location would be not ready to shoot until the day, but we still wanted to be prepared. So me and Rich worked out which shots we would need, setup the camera with the correct focal length, and we just stood in place. It may not look fancy, but on the day we knew the types of shots we needed to film. Once you have gone through your script you can now create your final shot list. We use shot lister to do this, but there are many other programs out there and a lot of people just use word. From your final shot list and storyboards you can now go back to your script and line it. Shot 1P is at the end of scene 1, and is when The Medium is talking face to face with the Flyswatter for the first time as he has just come out of the toilet cubicle. There would be no point filming this shot of The Medium before this point, so on the script write down when this shot should start. 1P starts with The Medium delivering the line ‘Who Rocky Johnson’, The Flyswatter will pack up his stuff, walk out of the cubicle, The Medium will start to deliver his line, the toilet door will open, King Tonga and Bobby Jazzler enter the room, The Medium will finishes his lines, then shot cuts. Shot 1J K L M N and O of the film is the same section of the script as shot 1P, all covering different angles. One piece of advice would be to get your actors to start a couple of lines before each shot would start, this helps them lead back into the role, in terms of dialogue and actions. Another reason lining a script is important is because it lets you know how long each shot should last, and from this information you can work out it will take to shoot each shot. Shot 3C, a WS of Jenny the stage manager which goes through a full page, you will know that the shot will take longer to shoot than 3D which only goes through only a paragraph. With this information you can schedule your shot list in a order that works best for you. Now you have the information from your test shooting about the shots you need, your storyboards are created, and your script is lined, you should have a clear understanding of what you need to shoot, helping you shoot faster on set. 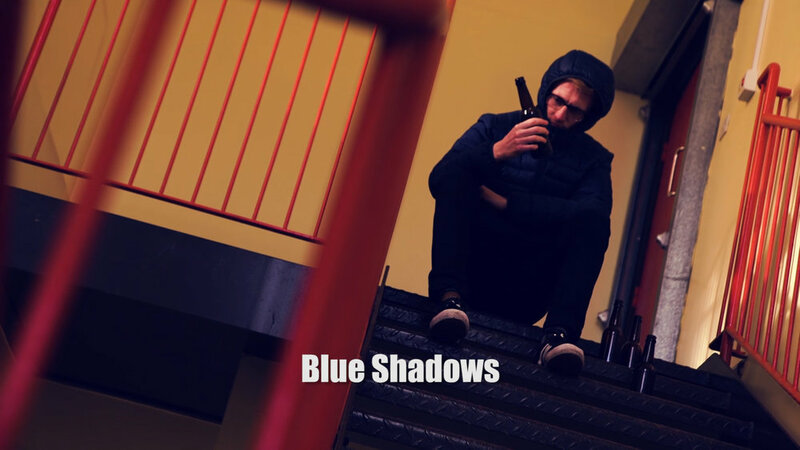 The script for our short film Backstage was 7 pages long, these techniques will work if your script is 1 or 90 pages long. 🚀http://bit.ly/illuminate-pack - RocketStock’s light leak pack, "Illuminate", is sure to impress your viewers. Shot using digital cinema cameras in 4K, it’s an unbeatable way to lift your video to new, cinematic heights. 🎵 http://bit.ly/track-boundforglory - Click here to download this episode's track. Check out Premiumbeat.com to discover a huge range of exclusive royalty free music! How much does a short film cost to make? You might as well ask how long is a piece of string. Let's put the film into some context. Backstage is 9 minutes long and it was shot over 3 days. Let’s break the cost of the film. We had a main cast of 3, Liam, Dan, and Aja. We also had a supporting cast of 3, James, Rich and Me. The 3 main cast and our 1 supporting cast member all worked on the film for free because they just wanted to help make the film. Our crew size was 8, we had Emily who was the producer and 1st AD, Rob (not me) was a 1st AC, Ed was on sound, Kristian was our script supervisor, Adam filmed this wicked steadicam shot, Jack filmed BTS, and Alex was our clapper loader. Just like the cast, our crew worked on the film for free. Since the cast and crew worked for free we made sure we provided food and drinks. Even if you are making a no budget film, make sure you provided food for your cast and crew, it goes a long way. Along with the food for the cast and crew we paid for people's travel expenses. You don’t want people to be out of pocket for your film. The location we used for the film was an old school which is ran by a local church. They allowed us to use the location for free, whenever we wanted. We did not have to, but we did make a donation to the church for allowing us to have access. If you find yourself in this situation, just work out what you can afford. You don’t have to donate a lot, and whatever you do will always be appreciated. The only prop that we really needed in the film was the announcer's microphone. We made this out of cardboard and foam which we had laying around, so it didn't cost anything. 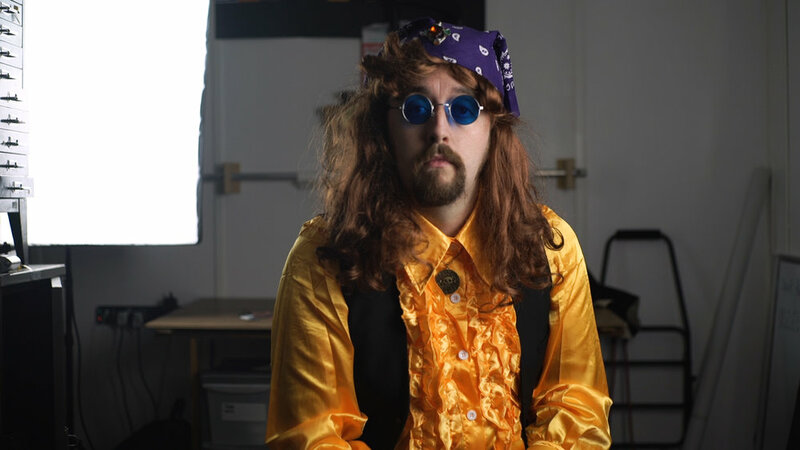 When writing this film we knew we would need to spend a bit of money making sure our characters fit into the world. Some of the costume items we had to buy were the Mediums yellow shirt and waistcoat, the fly swatters Knee pads, headphones, and even this foam hand. The location we had for the set was very flexible, we boarded up the windows and created skirts for the lights with cardboard we already had, but we did spend money on paint. To dress the rest of the set we only used what we already had, and ordered some event posters for the room. 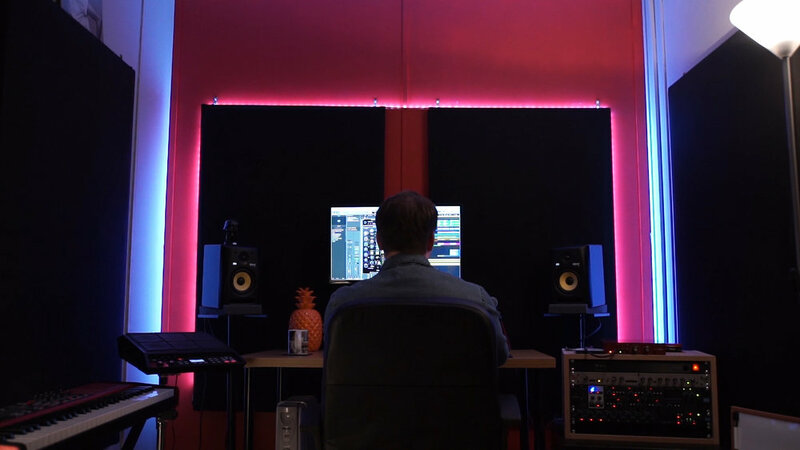 The music in the film is all original and was created by our friend Jordan who runs Pamplemousse Recording Studio. He did this as a favour as he just wanted to help create the film. When we started this project we put aside £350 to make Backstage. The total cost of the film was £470. Slightly over our original budget but just by a little. In the list we did not include the camera equipment we used to make the film. The reason for this is because the camera equipment did not cost us anything for this production as we already own the kit we used, and have for sometime now. Anything we personally do not own like the wireless follow focus and disco light that we used to make the film were all borrowed and provided in kind. Backstage could have been shot on more expensive equipment, but it could have also been shot on camera equipment which was cheaper. For the purpose for this list we have included a rough cost of the equipment if you were starting for nothing. £4,850. The total cost now comes to £5,320. If you already own the camera equipment and it is good enough for you to make films, just go out there and make films. We spent £470 making Backstage and in the grand scheme of things this it not a lot of money and you don’t even need to spend that much. Sam Mendez says “When you have a cast of 20, this means you have 20 other imaginations in the room with you. Use them.” And that’s exactly what we did on our latest short film Backstage. Today we are going to talk about further developing a character’s backstory by hot seating our actors. So this is how hot seating works: an actor will sit down and assume the role of their character. It’s up to you as the interviewer to ask them questions about themselves; their family, their work, their habits, pretty much anything which will build up a backstory. It’s a way to expand a character’s biography on the spot by having them improvise answers based on their current knowledge of the character. You can ask the actors to play the role during the interview, or if improvising isn’t their thing, you can simply discuss the questions and answers together. The first person we hotseated was Aja who plays the Stage Manager, Jenny. We gave Aja some basic information on the character such as her age, brief personality traits, and the purpose of her role in the film. How do you feel about the North East Wrestling Federation? Tell us about your relationship with your parents. Tell us about your relationship with the wrestlers. Are you thinking of quitting? Do you have any other jobs lined up? Straight away, Aja started to expand the character. She invented the relationship with Erik AKA The Medium and how she has known him since she was a child. Her father used to run the NWF and she would be involved in the activities from a young age, so she’s been around community centre wrestlers her whole life. We didn't write that. Aja did! On the spot! With added backstory information like this, Aja is able to more comfortably place herself in the shoes of the character, and give the character meaningful emotional beats in the film. And because we hotseated the character together, we both had an understanding of the character as a whole, which made directing her performance even easier. We also hotseated Liam who plays Erik AKA The Medium. With Liam, his character was playing a character, so we actually hot seated both The Medium and Erik as separate personas. Again, we gave Liam some basic information on the character, but left it up to him to flesh out role and make it his own. By leaving a few empty pages in the character biography the actors are able to insert their own information and in turn it helps them play a more convincing role. You can also use the technique of hot seating as a writer to expand your knowledge of a character you are writing. You may not put a character’s favourite cereal into the script, but it will help create a more rounded and realistic character as you are thinking further into the life of this imaginary person. So next time you need a bigger backstory for a character, try hot seating. 🎵http://bit.ly/pb-happyfunkyday - Thanks to PremiumBeat for providing the music for this week's episode. Check out Premiumbeat.com to discover a huge range of exclusive royalty free music! Getting The Film Look is more than just changing camera settings. Costumes are a massive part of creating a cinematic image and there are several key decisions YOU can make in order to help achieve unique and an interesting costume choice..
One of the biggest impacts you can make to the image of your film is your choice of costumes for your characters. Every fabric, colour, length, and design is telling the audience a very particular visual story which you have control over. We certainly aren’t massive costume designers to any degree. But with the few projects we have made, we have discovered some key decisions which help aid the reasons for the design of a costume. Realism is an important one. This doesn’t have to mean realistic in our world, but realistic in the film’s cinematic world. Zombie film? The clothes need to be stained, weathered, and strictly functional. A 1980s Community Centre Wrestling Event? Well all of the wrestling costumes will be cheap and nasty, and the fashion choices will steer towards the image of that decade. Next you want to think of the colour and and texture. Choosing a few strong colours will look better than a mix-mashed pallette. And pick clothing which will pop from your background and environments too. In our short film Backstage we choose a bright yellow shirt for our character The Medium, in order for him to stand out from the blue walls of the locker room. The Flyswatter another character in the film needed to contrast The Medium so we inverted his colours and went for majority black, with gold accents. To go deeper into this, The Flyswatter’s casual clothing is typical 80s fashion, double denim. This gives a stark contrast between his comfort and discomfort in the film. His light blue denim clothing also helps him pop on screen in the dark car park. 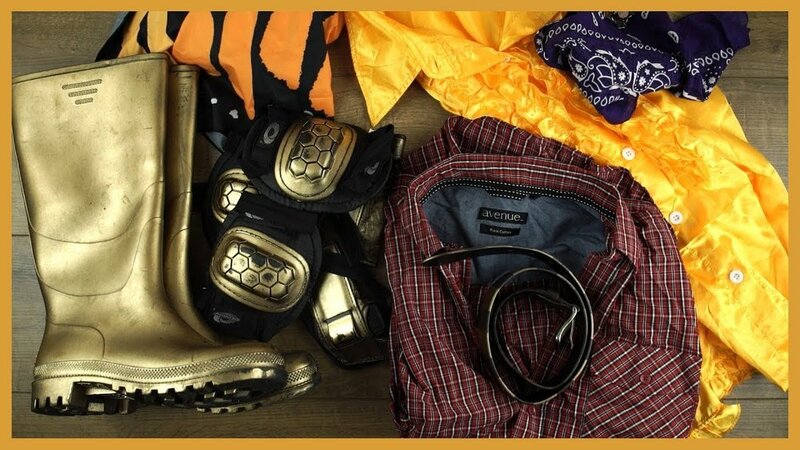 In films spanning over a large length of time you’ll need multiple costumes. So pick a style for each character and don’t vary it too much. This is evident in real life too. I’m a sweater-guy. You will see no logos or brands on them, and they will usually be dark and wooly. The sweater is always accompanied by a pair of chinos. This is my costume design. Richard is even more basic. He is a T shirt guy and it’s usually dark. If fact I am sure he only has 3 different T-Shirts. This is his costume which he rarely differs from. So next time you are design costumes, put yourself in their shoes and try to figure out what purchases they would make in a clothing store, or how they have acquired their clothes. Then make the cinematic choice; pick contrast colours which help them pop on screen. This will get you one step closer to achieving the Film Look. http://bit.ly/track-the-funk - Click here to download this episode's track. Check out Premiumbeat.com to discover a huge range of exclusive royalty free music! We have a few different DIY methods to diffuse sunlight from a window. Most of the time we use a frosted shower curtain. It’s easy to pin up and does a solid job. If the window is in shot we sometimes cut out sheets of greaseproof paper and place them inside the frame. This is handy for exposure correction, diffusion, or if you want to disguise the view from outside. But what if the window has 17 visible panes? What if you want to diffuse the light and disguise the view outside and simply don’t have time to cut out every single sheet for every single pane? Let me introduce YOU to Diffusion in a Can. We went shopping for gold spray paint the other day and noticed this, Frosted Glass Spray Paint. Primarily used to give your windows a snowy Christmas feel, we wondered if it could work to diffuse a window from harsh sunlight. To give it a fair test; we blocked out the light in the studio, rigged up a pane of glass, shone an LED light panel through it and recorded a bunch of tests. We’re going to get a little science-y now with f stops and exposure values. I put a link down below explaining it all if you want to learn more. NO DIFFUSION is our reference test, and this gives us a light metre reading of f4, 1/48, ISO 200, 24fps, which is essentially same as our settings, so the shot is correctly exposed. Next we added the frosted shower curtain. You see here that it does a good job of diffusing the harsh light. The light metre gives us a change in value from f4 to f2.8 which means that it has halved the amount of light hitting Rob’s face. This is why our shot is a lot darker - we are not changing the camera settings for purpose of the test. Then we swapped the frosted shower curtain for the greaseproof paper. Again, this does a good job of diffusing the light and creating softer shadows. 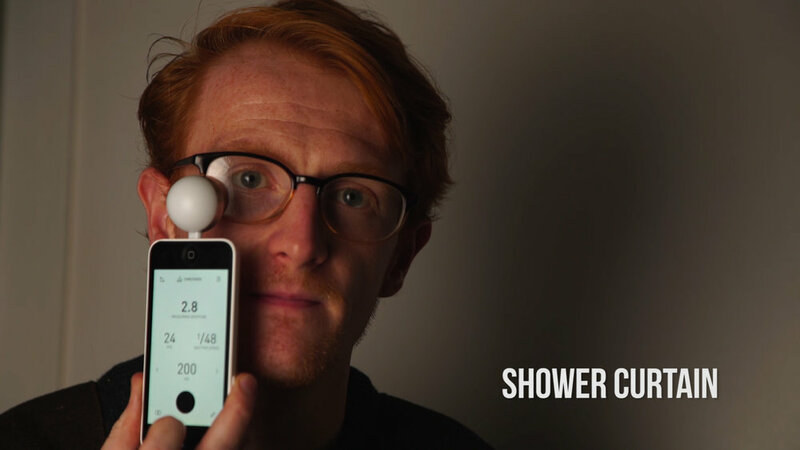 The light metre gives us a reading of f2, reducing the light twice as much as the shower curtain. We currently have a quarter of the light coming in compared to our first shot. The light metre is telling us that in order to expose the image correctly like our very first test shot, we need to add more light; either by changing the settings on the camera, or by adding a brighter light source. Anyway, let’s see how the frosted glass paint did! We sprayed several even coats of paint onto the glass and waited around 30 minutes to let it dry. As you can see, the paint did very little to diffuse this light source. The only difference I can spot is the added roundness of Rob’s shadow. Evidently, the light metre read f4, so it did in fact retain most of the light coming in for our test. But this doesn’t mean it isn’t diffusing the light. So we tested it on a much bigger source! 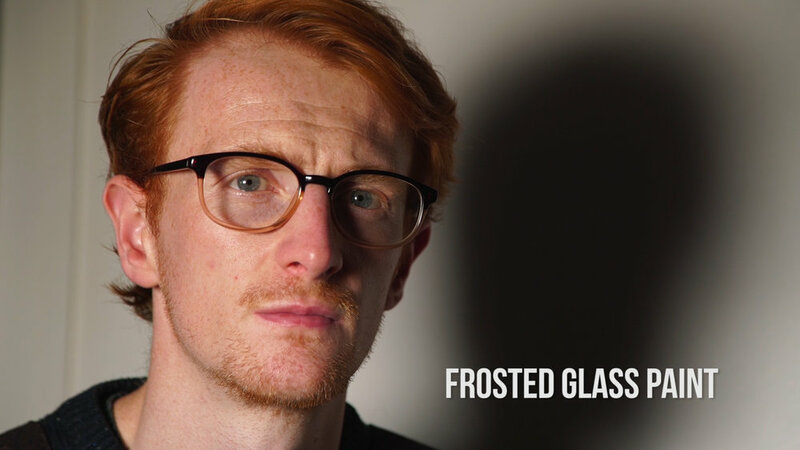 For our second test, we put the greaseproof paper and the frosted glass paint head to head to see which can seamlessly diffuse the window faster. Rob uses the roll of greaseproof paper, scissors, and some sticky tack. And I used the frosted glass paint and some masking tape to protect the paint work. The greaseproof paper method took 30 minutes and 41 seconds to complete 6 panes. The paint and masking tape method took 16 minutes and 24 seconds to complete 6 panes - almost half the amount of time. Rob admitted that to get a completely seamless effect with the paper, he would have been working on the panes for at least another half hour. The paint is definitely the quicker option with a more seamless finish. To cap it off, here are some examples of the painted window panes diffusing the direct sunlight. The paint does diffuse pretty well given a large enough surface and a harsh enough light. At this point you might be wondering if frosted glass paint will do harm to your window. Let me show you just how easy it is to remove using a glass scraper and some window cleaner. Simply spray the pane with a good amount of window cleaner and leave it to soak in for a few minutes. Then take your glass scraper, and with a little pressure, remove the layer of paint. If it’s wet, it should come off like a layer of cellophane. Grab a towel and wipe any residue off - it’s as simple as that. So if YOU need a quick, easy, and fairly cheap way to diffuse and hide the view of a window which is in shot, grab yourself some diffusion in a can. You can find links to the frosted paint and the glass scraper we used in the description below. http://bit.ly/corruption-pack - With glitchy overlays, distorted logo reveals and more, RocketStock’s "Corruption" is an ideal way to give your project a dramatic edge. 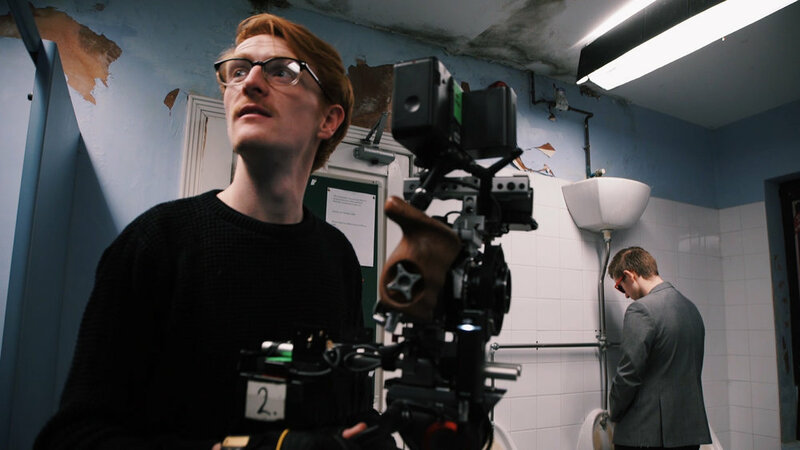 When you are funding your own short films, it can sometimes be difficult to find the cash to pay your cast and crew a proper wage. Instead we rely on volunteer filmmakers and actors. But, this doesn’t mean we can’t offer them something valuable for their time and effort. This is what you can do if you can’t pay your cast and crew. We aren’t professional filmmakers. Not in the traditional sense at least. We aren’t tied to a studio, we don’t have a budget, we don’t earn a wage from making movies. 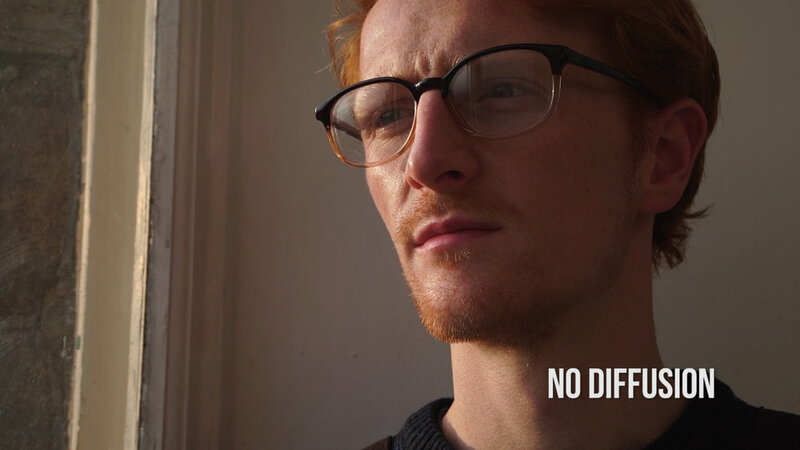 We’re amateurs who fund our own short films because we love making them, and the cast and crew who are a part of those films are in the same boat. But this doesn’t mean we can’t offer back something valuable back to those who are helping out. If you can’t afford to pay your actors, how can you re-pay them for volunteering their time? Headshots are always a good choice. At our level, most of us are shooting on stills cameras in video mode. Headshots can be expensive for a struggling actor, so if you can shoot them free of charge, you’re on your way to paying back your debt! If you want to go the extra mile, shoot a video monologue for them. It doesn't have to be over the top, but something sharp, well lit, and sounding good is a lot better than them shooting it on their phone. You never know, it might help them get their next job! If they are volunteering in your film, give them a copy of it, without watermarks, for their showreel. In fact, offer to edit their showreel for them! Again, it doesn’t cost you anything but your time, which they gave up to help make your movie. We make our own film posters too, so grab their signature for when they are famous, and print a copy for them to take home too.With crew, it’s a “I scratch your back” sort of deal. Again, if you can’t fork out the cash, make a note of what they sacrificed when they helped you; the hours they worked, the cost and distance of their travel, any kit they brought with them, and their value on set. When they need you, match their value.If you aren’t paying your cast and crew, you should make their time on your film as comfortable and as convenient as possible. If they need to leave early, they leave early, don’t fight it. If they can only start late, that's perfect, they start late and you get a few hours with them. If they need a lift home and there is a car available, taxi them home. Make their time helping you as simple as you can. Always work around them, not the other way around. If they have to go completely out of their way to help you, they might not bother next time you ask for assistance. Best of all, feed people. Free food is great, and if you ask them what dietary habits they have beforehand, it's a lot easier to please them. Pizza is a staple student film cliche. But it's not always the best option, so find out what their favorite meal is, and grab the cook book. And when you reach the stage when you CAN pay your cast and crew, remember those who did it for nothing, and maybe give them a call. 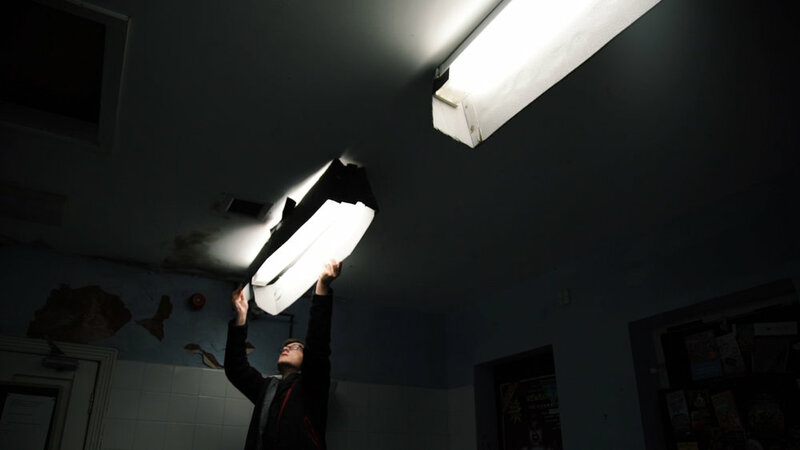 http://bit.ly/illuminate-pack - RocketStock’s light leak pack, "Illuminate", is sure to impress your viewers. Shot using digital cinema cameras in 4K, it’s an unbeatable way to lift your video to new, cinematic heights. http://bit.ly/track-poolside - Click here to download this episode's track. Check out Premiumbeat.com to discover a huge range of exclusive royalty free music! 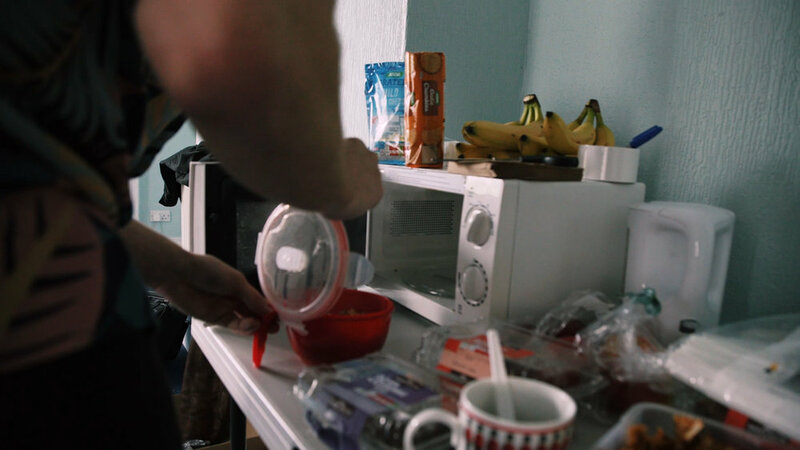 In this video we breakdown how we made our micro documentary Undeveloped. If you want to watch Undeveloped you can find it below. http://bit.ly/track-solid - Thanks to PremiumBeat for providing the music in this week's video. Check out Premiumbeat.com to discover a huge range of exclusive royalty free music. 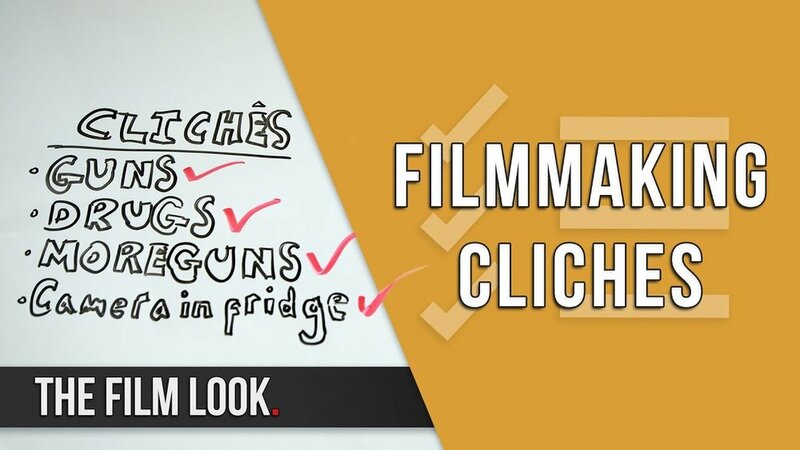 Filmmaking Cliches: Should You Avoid Them? Everybody wants to make unique and original films. Nobody wants to be the person who made something predictable and cliché. But this sort of thinking can actually be detrimental. Instead of creating something you really love, you are putting all of your effort into making sure it ISN’T something! In my personal opinion, I think cliché is something we should embrace in the early stages of our filmmaking careers. Chances are, your new film is pretty similar to something someone has already made, and avoiding cliché is just another worry you don’t need to be concerned with. Creating cliché or predictable films is a filmmaker’s way of stretching their muscles and trying out something they haven’t done before, using the existing material as a blueprint for a new exercise. So in the spirit of this, we’ve compiled a list of indie film cliché moments. We’ve been guilty of many of these in the past, and we have even shot a few extras just for this video. If you’re having fun making your movie, and you’re learning a lot from the process, you’re making progress no matter what you’re shooting. You might not win any awards , but you’re one film closer to making your masterpiece. This week Rich does a live demonstration on how to weather a baseball cap. Here are the original storyboards for the gang scene in Corpse. Poorly drawn and all over the place. 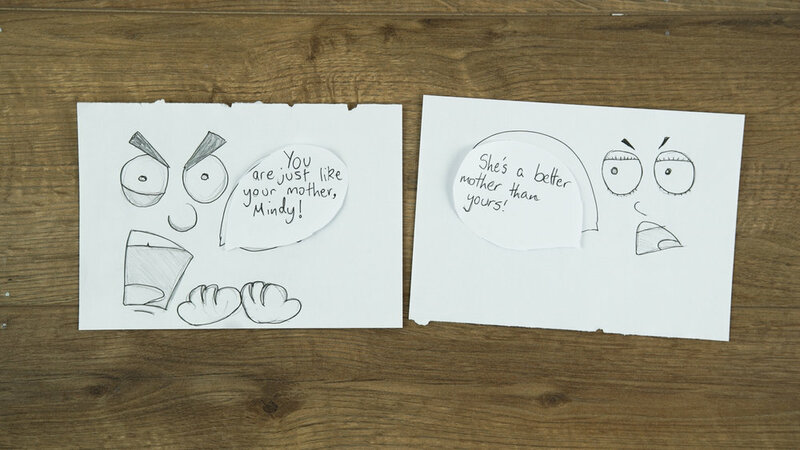 We re-created the storyboards using photos taken in my living room. By test shooting it allowed us to find common trends in the shots, which allowed us to combined them, and reduced it down to this. Reducing your shot list is actually a really helpful way to achieve the film look, and today we'll show you how. 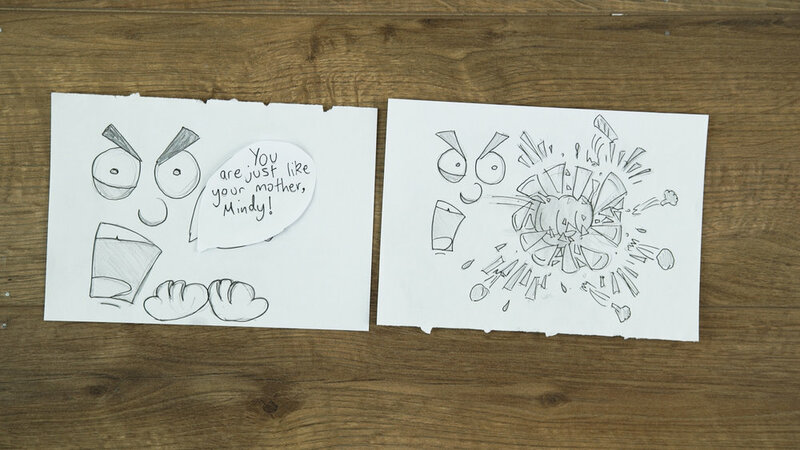 Here is a prime example of too many shots in a storyboard. You have 3 close ups in a row here. Gino giving the knife. Tilly's face. Gino eating some pills. But these shot types are to similar to each other and cutting them together would not look right. So we turned these 3 shots into 1 with movement by stitching them together and using a pan and tilt. Jason crouches. CU of pills. Jason picks them up. Jason's reaction. 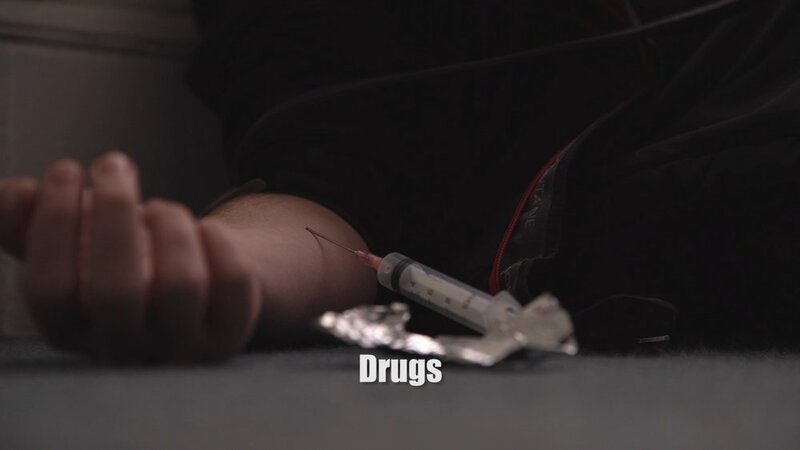 Or: Jason crouches, and picks up the pills, then we see his reaction. In a way, you can think of stitching shots together as adding commas to a sentence instead of using full stops. Commas create sentence flow, just like how pans and tilts make the movie flow. 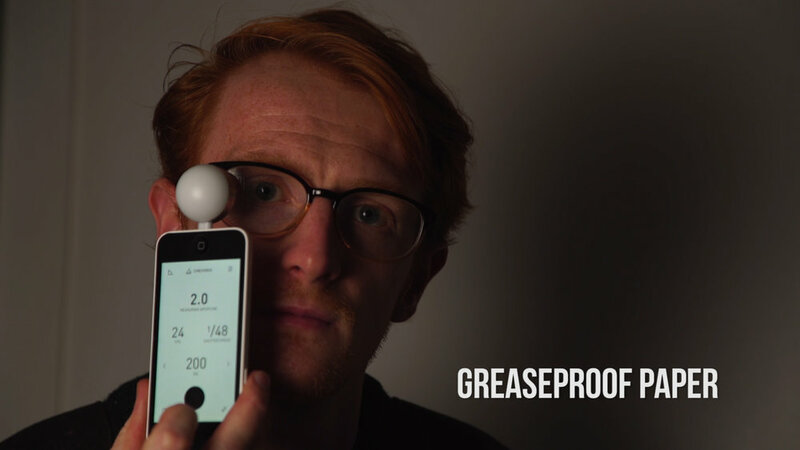 It increases the efficiency of your shot list, which results in a quicker and more efficient turnaround on set. And it makes you think about your shots as more than just a compilation of coverage. As they say, limitation drives creativity. Our short film Corpse is based in a world of scavenging and depleting resources, and our character's clothing needed to match. 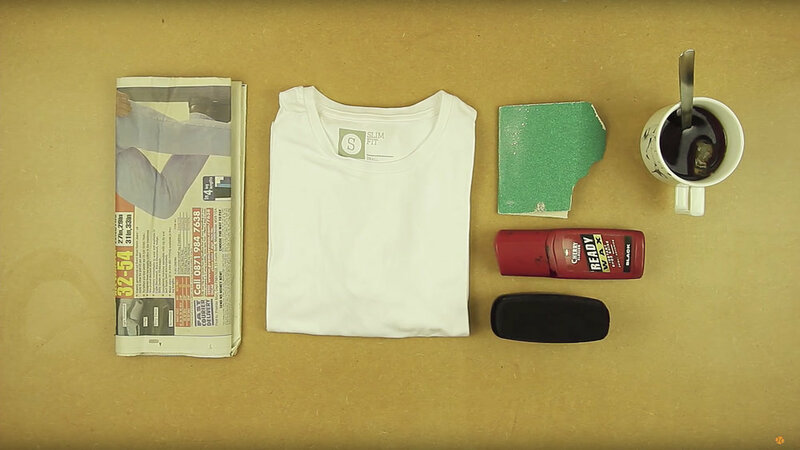 Here are a few simple methods to make clothing look worn and dirty. Firstly, for a base weathering, give the clothing a complete sand down. Once this is done, you can pay close attention to areas like the collar and give them little details. After you have weathered it down, take a brewed teabag and dab the clothing, giving it stains. I add more tea stain to the collar and underarms to make it look like stale dried sweat. Grab the sponge and add a bit of shoe polish. Then dab the sponge onto your newspaper until most of the polish is off of the sponge. This method is very similar to dry-brushing with a paint brush. It only applies to the top-most part of surfaces, like the collar here. 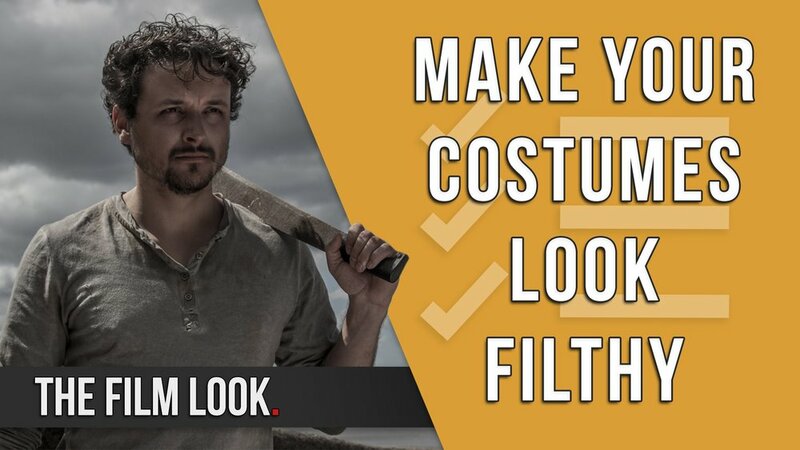 We used these methods for all of the costumes in our film Corpse. For some costumes, we cut a hole at the stitching point and ripped it open to damage the clothing. A scene in our recent short Corpse requires a guy getting his head kicked in. Now WE follow the rule of "working with the resources you have in the best possible way", and getting a fake head to stand on, or doing it with VFX was going to cost a lot of time and money. So instead, we decided we wouldn't show it at all. Now we could have shown his head being caved in, but what would that achieve? A cheap gimmick, a shock horror moment, sure. But the story would be the same, so what's the point? Anyway, here's how we did it. Try to record audio in the original location. If you can't, find a similar alternative. We shot the scene in forest, but we recorded in my back garden. They were both outside, the wind levels were similar, and there was very little background noise. We used bell peppers to get a good crunch for the skull crushing sound, and used a water melon for the juicy brain sounds. It had also been in the back of my fridge for a very long time, so it went REALLY juicy! Also...before you start standing on them, don't wear your favourite green chinos like Rob did. It's messy stuff. I cut up the best sound effects and matched them with the foot stomps. For added brute force, I added a punch sound effect to every kick and stomp. And finally for extra ambience, I added some thunder in the background. And there you have it. A cheap and effective way to smash your friends skull in! You can find the sound effects from this video in our store to download for free.